Report sent by Steve Fields: "In contrast to the past weeks racing, today turned on overcast skies with light rain, however a freshening SSE of 16-18 knots coming off shore over Vincentia delivered some smooth sailing. The first race of the day got off to an early start with race officer John (Hoop) Hooper setting the course to 1GO at 0.9 nautical miles and saw Fijian competitors John Philp and Douglas Edwards get to the A mark first. They were passed on the first down wind leg by previous, multiple World Champion Blaine Dodds and daughter Roxanne Dodds from South Africa who continued to hold the lead all the way to the finish. Philp and Edwards held on to second while West Australians Darren Smith and Kerstin Houk came in third. 56 were split from the 88 for the finals and new boat assignments were issued for the final race of the Hobie 16 Masters Class. Winds picked up for the final blowing a consistent 24 knots with gusts of up to 35 knots continuing from the SSE, the course was again set to 1GO and 0.9 Nautical Miles. Husband and wife team William and Lucinda Edwards from South Africa had a brilliant start, putting them in the lead which they held throughout a very taxing race contending with the gusts as well as some fierce competition from the rest of the field. The South Africans were followed closely by Byeongki Park and Haekwang Youn from Korea and New South Wales former champion Mick Butler and son Patrick Butler picking up third. 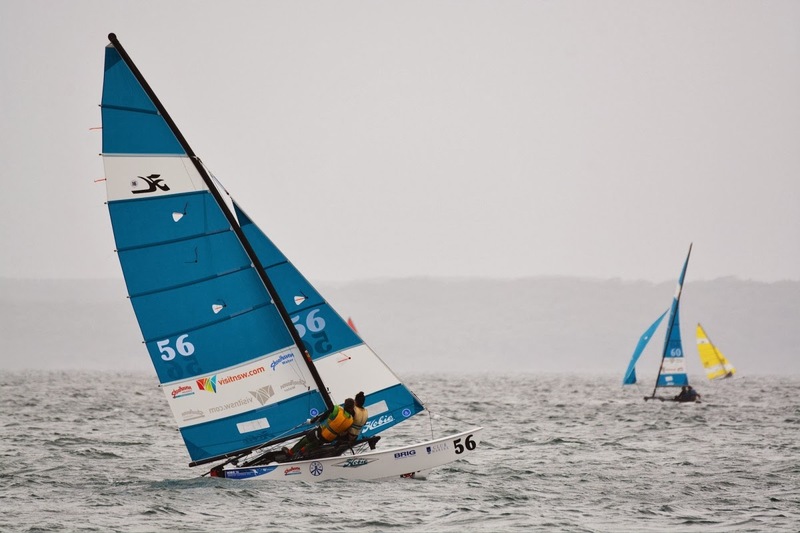 After the race, boats returned to shore, rain squalls and gusts of wind up to 35 knots continued for several hours after which, the race committee signalled AP over A flags concluding the days racing and crowning South Africans William and Lucinda Edwards the new Hobie 16 Masters World Champions. Complete race results and interviews are posted on hobieworlds.com and the awards presentation will commence tonight. Racing continues with the first rounds of the Hobie Grand Masters, Hobie Women and Hobie Youth classes kicking off tomorrow.